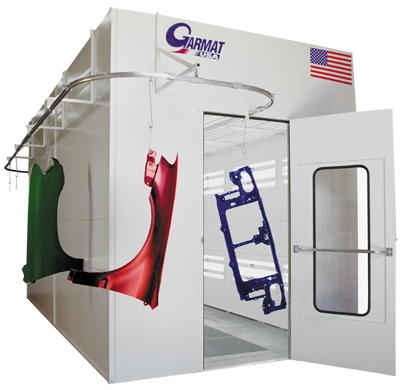 Garmat® USA provides parts jamming booths to meet your shops’ small parts requirements. Parts jamming booths are designed for priming or finish painting. They recycle the filtered air back into the shop environment. They are single wall construction and have overhead lighting to make easy work of priming, finishing and airbrush operations. 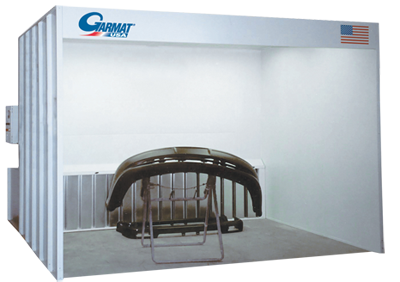 If you are looking for a way to increase productivity in your paint shop, the Garmat® Quantum™ Parts Jamming Tunnel can help accomplish just that. With the Garmat® Quantum™, you are provided with a downdraft environment for refinishing parts. The Quantum™ comes standard with a closed loop rail system, four 4-tube interior accessible light fixtures, your choice of air make up system (see models page), and inground pit. Additional light fixtures, additional cabin lengths and wheeled push carts (supplied by others) are available options.